While gearing up to prepare ride descriptions for our weekly group mountain bike rides on Sunday afternoons, we got out and rode a few of the West Maui mountain bike trails! As the images from our rides show, the mountain bike trails above West Maui are mostly moderate climbing with fun red dirt trails, plenty of challenges and spectacular scenery. Depending on where you ride in West Maui, you may need to navigate your way through ruts, over tree roots, around lava rocks and sometimes through tall grasses. Even if you don’t climb all the way to the top of the 5,000 feet West Maui Mountains, you’ll be rewarded with amazing scenic views. And riding back down after climbing the trails, the downhills provide plenty of off road cruising on fast single track trails and a few wide open spots to pass your fellow riders! Though there are no official mountain bike trails open for public riding in West Maui, if you are courteous and respectful, you can usually find more than a few trails to ride on Lahaina side of Maui. Some like to ride in the defunct pineapple fields above West Maui while others make their way riding the utility maintenance access roads or ideally find friends with permission from the owner to ride on private lands. Regardless of preference, ride a couple thousand feet up where the uphill bike climbing effort is rewarded with amazing scenery and views! Once heavily planted for commercial agriculture production, the mostly abandoned sugar cane and pineapple fields above Lahaina and the Kaanapali resort provide opportunities to utilize the former ag roads as mountain bike trails in West Maui. After climbing a thousand 1000 foot or so in elevation, be sure to pause for a hydration break long enough to enjoy the coastal views extending from Kapalua to the Kaanapali Resort or south into Lahaina and beyond. On clear days you'll be able to see for miles and miles! Shoot a photo of the cruise ships moored in the channel between Maui and the neighbor island of Lanai. Pose with your mountain bike in the foreground and share your best Maui mountain biking photo with us on our Facebook page. During the winter months, be careful to not get distracted by the whales jumping while biking down one of trails! Please be courteous and respectful to landowners. 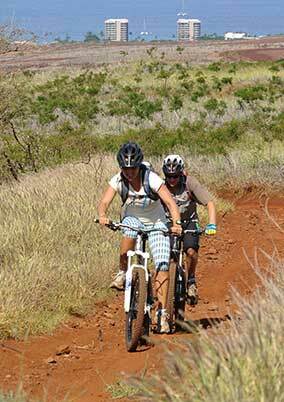 More West Maui Mountain Biking Trails? Map of West Maui terrain for mountain biking above Kaanapali and Kapalua. Efforts are underway to open access to areas for the public to enjoy mountain biking in West Maui. While the XTerra World Championshipbike courses are asked about many times a week, since large sections of the course are on private lands they currently remain closed to the general public. Efforts are being explored to open at least portions of the XTerra course for mountain bike riding and some day we hope to have a mountain bike park or a connected trail system in West Maui. The Kapalua Resort and related golf course management companies control and manage parts of the XTerra course while other private land owners grant permission only for the organized races. To get an idea of the XTerra course and where mountain bike trails may someday co-exist for public use, go hiking on the former Village golf course hiking trails at Kapalua Resort. If you’d like to get involved or support mountain biking on Maui, join the Maui Mountain Bike Coalition (MMBC) or contribute to support their efforts. Working in conjunction with the IMBA (International Mountain Bike Association), the MMBC is the state’s first local IMBA chapter and is working in partnership with the Hawaii State Department of Land and Natural Resources (DNLR) to successfully gain access to land for more mountain bike trails on Maui. Among other efforts to increase access for mountain biking on Maui, working with private land owners and the county the chapter’s plans include developing a mountain bike trail system for West Maui and eventually Lanai and Molokai. Find out more about the MMBC on their Facebook page where you can learn how how you can get involved in their latest trail building activities slated for this summer with a new mountain bike trail in the Makawao Forest. Spread the word about the next MMBC meeting on Sunday, April 21. After the meeting, help with trail work and go for a ride with a potluck bbq. Join the MMBC local chapter of the IMBA or make a donation. Or, talk to Moose when you stop in the West Maui Cycles bike shop in Lahaina. Moose is our in-resident expert on Maui bike trails and one of the organizers of the local chapter of the MMBC. Mountain bike riding on Maui.